Sending Email from an Android app is not difficult if you want to open up another Email App that handles sending the Email. We can just achieve that by adding an ACTION_SEND intent and we can also set content type and use extras such as EXTRA_EMAIL, EXTRA_CC and more. If we start this intent, all the apps that can handle emails such as Gmail app, default Email app will be shown in a chooser dialog if you haven't chosen a default already. Then your user can easily manage the creation and sending of the email from the third party app. But that's not always the case, some times we are required to send an Email from our own App with a fixed Email address to a specific Email address, for example if we need to send a password recovery link on the click of Forgot Password, recovery link to the user should be sent by email from within our app with our own Email Address. 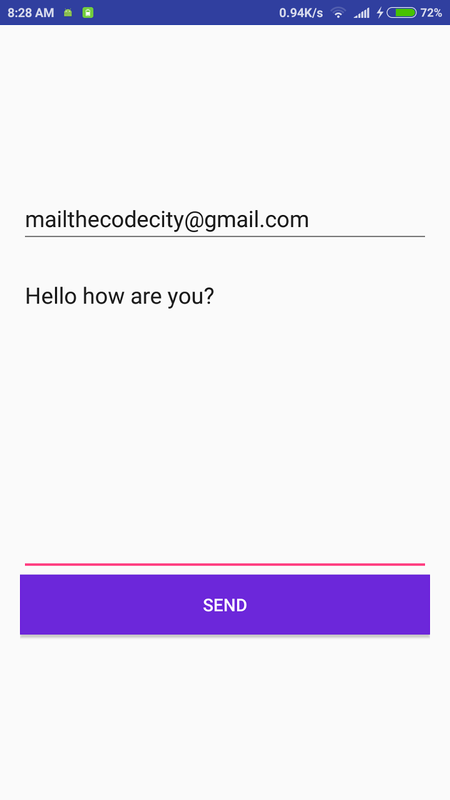 In this post we will learn how we can send Email directly from an Android App without and Intent. So let us begin. We create a JSSEProvider class. We create a MailSender class that handles Authentication for our Email and sends Email directly without intent. First of all download the 3 files- Activation.jar, Additional.jar, Mail.jar. These are libraries that allow us to send Email in Java. Once you've downloaded theses files, put it in the libs folder inside your app directory. If you don't have a libs folder inside your app folder, create one and place these files inside the folder. Now you are done with libraries part and are ready to code the Email Sender App. Finally we have our app ready and we can call this method whenever we need to send the Email directly from the app without any intents. You can find the full source code below, Cheers! NOTE: Gmail has disabled logging in to accounts by third party apps. You need to disable this feature of Gmail and allow logging in from any app otherwise you won't be able to login and Emails won't be sent from your account.